Sapindus Mukorossi . com - The Complete Soapnut Guide! 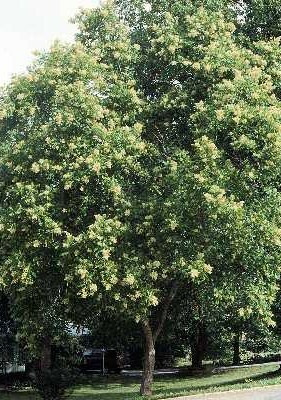 A deciduous tree found wild in north India, usually with 5-10 pairs of leaves, solitary with large drupes. This tree belongs to the main plant order Sapindaceae and family Sapindeae. The species is widely grown in upper reaches of the Indo-Gangetic plains, Shivaliks and sub-Himalayan tracts at altitudes from 200m to 1500m. Also known as soap-nut tree, it is one of the most important trees of tropical and sub-tropical regions of Asia. This tree flourishes in deep clayey loam soil and does best in areas experiencing nearly 150 to 200 cm (60 to 80 in) of annual rainfall. 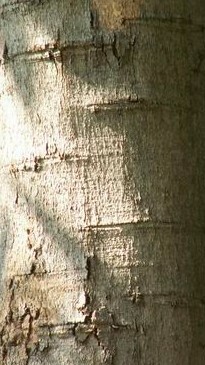 The trunk is straight and cylindrical, nearly 4 to 5 m (13 -16 ft) in height. The canopy comprising side branches and foliage constitutes an umbrella-like hemispherical top measuring about 5 m (16 ft) in diameter. The tree can reach a height of 25 m (82 ft) and a girth of 3 to 5 m (9-16 ft) in nearly 70 years of its existence. The wood is hard and light yellow in color. It is close-grained and compact weighing about 30 kg (66 lbs) per cubic foot. The wood is utilized for rural building construction, oil and sugar presses, and agricultural implements. It flowers during summer. The flowers are small and greenish white, polygamous and mostly bisexual in terminal thyrses or compound cymose panicles. These are sub-sessile; numerous in number and at times occur in lose panicles at the end of branches. The fruit appears in July-August and ripens by November-December. These are solitary globose, round nuts 2 to 2.5 cm (1 in) diameter, fleshy, saponaceous and yellowish brown in color. The seed is enclosed in a black, smooth and hard globose endocarp. The fruit is collected during winter months for seed and/or market sales as "soap nut". The Sapindus Mukorossi tree is one of several that bear fruits that are commonly referred to as soap nuts, of them the soapnuts from the Sapindus Mukorossi tree have the highest saponin content. Saponin is a natural detergent commonly used for cleaning among many other things. Soapnuts have been used medically as an expectorant, emetic, contraceptive, and for treatment of excessive salivation, epilepsy, psoriasis, head lice and migraines. Studies have shown that saponin from soap nuts inhibit tumor cell growth. Soap nuts are among the list of herbs and minerals in Ayurveda. They are a popular ingredient in Ayurvedic shampoos and cleansers. They are used in Ayurvedic medicine as a treatment for eczema and psoriasis. Soap nuts have gentle insecticidal properties and are traditionally used for removing lice from the scalp. Soapnuts have long been used in the Western world for soap production, usually together with many chemical additives which are not necessary for the actual washing process and are damaging to the user as well as our environment. Soapnuts have become a very popular environmentally friendly alternative to these manufactured chemical detergents. The seeds tend to germinate easily. To ensure the best results for germination, the seed is soaked in warm water for at least 24 hours and then sown (some prefer to scarify the seed surface prior to soaking by filing, scraping or carefully striking), either directly in already prepared pits at 5m x 5m (16 ft 16 ft) spacing or sown in pots filled with clayey loam soil mixed with farmyard manure or similarly prepared nursery beds. Sapindus species are also a common food source for the larvae of some Lepidoptera species including Endoclita Malabaricus. Common Names: Soapnut, Soap Nut, Soapberry, Soap Berry, Washnut, and Wash Nut. 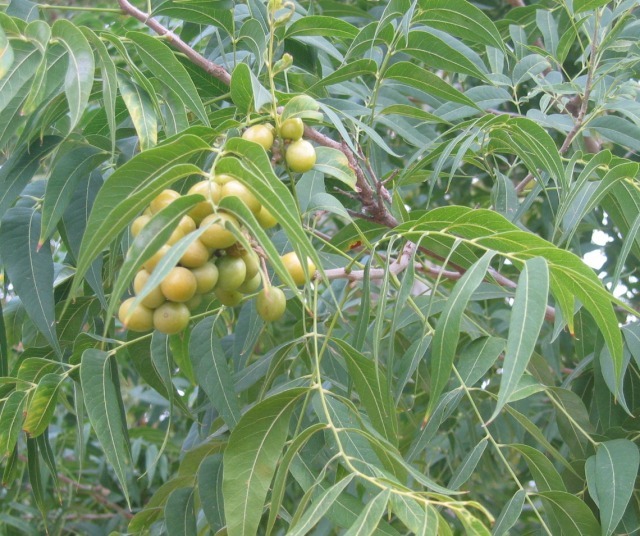 Sapindus is a genus of about twelve species of shrubs and small trees in the Sapindaceae (soapberry family), native to warm temperate to tropical regions in both the Eastern and Western Hemispheres. The genus includes both deciduous and evergreen species. 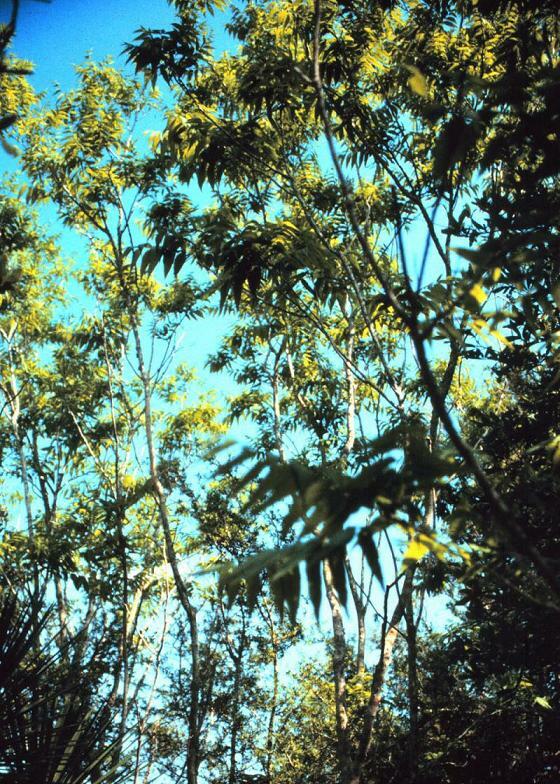 The leaves are alternate, 15-40 cm long, pinnate, with 14-30 leaflets, the terminal leaflet often absent. The flowers form in large panicles, each flower small, creamy white. The fruit, called a soap nut, is a small leathery-skinned drupe 1-2 cm diameter, yellow ripening blackish, containing one to three seeds. * Sapindus delavayi NA China, India. * Sapindus emarginatus NA Southern Asia. * Sapindus saponaria Wingleaf Soapberry Florida Keys, Caribbean, Central America. * Sapindus tomentosus NA China. * Sapindus trifoliatus South India Soapnut, Three-leaf Soapberry Southern India, Pakistan. You will find experimentation will be the best way to find how soap nuts will best suit your needs. When using them in the laundry make sure you take the following things into consideration; type of water you have hard or soft, size or your washing machine, size of the load you are washing, how soiled the items your washing are and the temperature you are washing at. For an average load of laundry you will use 3-4 shells (or equivalent in pieces), larger and dirtier may require 5-8 shell s and smaller loads may only need 2-3, harder waters may require more. Muslin/Cotton sacks are the most common things used for doing laundry with soap nuts and usually come with any soap nut purchase, but contrary to popular belief you don't need to buy one if you don't have one. Chances are you can use something you already have like an old mismatched sock, an end piece of tights or stockings, a bandana or hankie or if your crafty sew one out of an old t shirt, rag or piece of cloth (cotton, canvas and hemp all work well). Once you have your pouch situation figured out, put the shells in it, tie it shut, and drop it in the washing machine with your dirty laundry. You will not need to add any other detergent. Soapnuts wash most effectively between 30 and 60 degrees c (86 and 140 f) and will last on average about 2-4 washes. When the Saponin has been exhausted from the shells for laundry use they will look dark and feel soggy, at this point you can safely throw them on your compost heap or put them aside for making a mild soap nut liquid (see making soapnut liquid instructions below). They also make a great hand soap, just toss them in your blender with some water and viola hand soap. Doing laundry with soap nuts leaves your clothes incredibly soft without the need for fabric softeners or conditioners, so usage of fabric softener is no longer needed. However cleaning your laundry with soap nuts doesn't leave your laundry with much of a fragrant scent, so if you prefer laundry with a scent, you can add a few drops of essential oils to the wash. You can apply a few drops directly to your soap nut pouch before adding it to your washing machine or alternatively you may add it to some water and pour it in you softener tray or ball. Soapnuts are highly-effective and gentle at the same time. It will leave your laundry fresh and clean and compared to other detergents, its mildness will keep colors bright, and maintain the fabric structure of your clothes for longer periods. It can be used on all fabrics including delicates like silk, cashmere and wool. 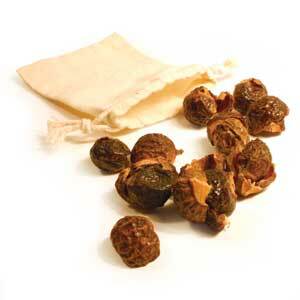 Soapnuts are all natural, hypoallergenic, biodegradable, ecological, and economical! Soap nuts are commonly used in Indian households for cleaning and shining jewelry. Jewelry is soaked in soap nut liquid and then rubbed with a cloth to give it a shine. Using soap nuts is an effective and natural alternative to repel insects off your plants and around the house. This easily replaces chemicals. This is a great use for left over soap nut liquid from washing or laundry. Simply use soap nut liquid in place of your regular shampoo! Since soapnut liquid does not foam like regular shampoo its easy to use to much liquid. If you find your hair is feeling dry or greasy you probably used to much. For best results reuse a shampoo bottle with a pump to help determine how much you need. It will naturally help prevent dandruff and keep your hair soft and strong. When using to treat dandruff apply the liquid soap nut on your scalp and leave on for 5-10 minutes. Make sure the liquid does not get into the eye as it will burn. Rinse hair with water. Also works well as a body wash! Add about 100g (about 2 handfuls) of Soap Nut Shells to approximately 12 cups (3L) of water. Crush the shells into smaller pieces before adding. Bring to boil, and simmer for approximately 30 minutes. The boiling process extracts the saponin from the nut shells and combines with the water. You can use the liquid immediately, or let it steep overnight. Strain into appropriate container and compost the remaining shells. You now have a concentrated, chemical free detergent that can then be used as a laundry detergent, shampoo, all purpose cleaner, car wash, liquid soap, pet shampoo, washing up liquid or any other things you would normally clean with a liquid. Experiment with longer boil times and water to shell ratios for stronger and weaker concentrations.